The Delta 23-197 8-Inch bench grinder can do a lot. It is perfect for smoothing edges on wood or counters, for repairing tools, or for anything else you might decide to use a bench grinder for. Starting out the motor in this 8-inch bench grinder is powerful at 5 amps. This allows the wheels to spin from 2000 rpm to 3400 rpm. The reason for the range is this bench grinder has variable speed control, which is one of the reason this is one of the best bench grinders on the market. The variable speed control is on the front so you can have easy access to it when doing your grinding, buffing, sharpening, or polishing. Like most bench grinders this one comes with a 36 grit wheel and a 60 grit wheel so you can start working right away. You can also get different wheels for all the other specific jobs you might need to do. The wheel guards are solid material and the rest of the motor housing is also really well made and durable. The metal base mounts easily to your bench and this bench grinder weighs 44 pounds, so it won’t go anywhere while you are working. Each wheel also has its own separate tool rest that can be adjusted, so you can leave one for working on one thing and have the other set for something else. The left tool rest also has spots milled into it so you can rest your drill bits on them and get the perfect angles when working on them. You can work with this bench grinder for a long time too because it has a water tray to dip things into as you are working on them to keep them cool. This is especially important when working on metal objects as they generate a lot of heat. Keeping things cool will also help keep your wheels lasting longer. One last feature of the bench grinder is that it has a light to make it easy to see what you are doing. While a lot of bench grinders have a light, it is important that they didn’t leave it off of this one. Now that you know the key features and why a lot of people consider this one of the best bench grinders we can take a look into real user reviews to see if the user experience is good. This bench grinder is pretty popular and has over one hundred reviews on Amazon with a 4 star rating. A lot of people love that this is a larger 8-inch grinder and not a small 6-inch grinder. The fact that it is bigger means it cost more, but it also means it can be used for more heavy duty things. The variable speed also comes in handy and the dipping tray is especially useful in heavy duty work because you can manufacture a lot of parts back to back. The motor in this model is also higher standards than some cheaper models, so it will last longer. The housing is very durable according to users and means the tools should last you a long time. One somewhat common issue though is the wheels can be wobble if you get one with washers that aren’t truly flat. The washers on the wheels are stamped metal and if they are bent the wheels will wobble. The quality control tends to be a lot better on the eight inch model and the people that get it don’t have the issue as much. This issue though is one reason why it is a good idea to buy on Amazon. By buying on Amazon you get there no hassle return policy, so if your unit comes with issues, then it is easy to return. Also, by buying on Amazon you are saving time from having to go to the store to get it and the store you go to may not even have it in stock. Lastly, buying on Amazon is probably the cheapest price you are going to find, so you are not only saving time, but you are also saving money. 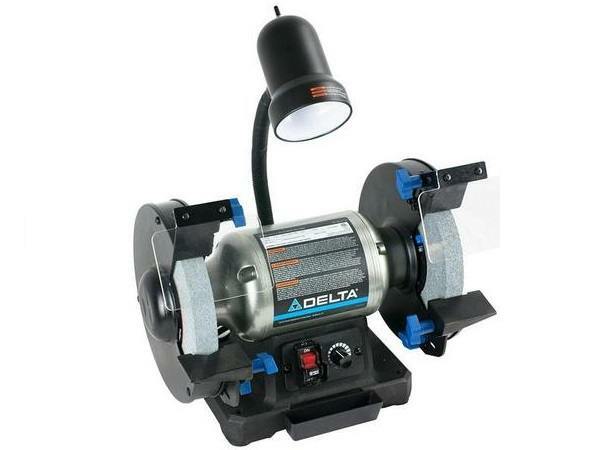 The Delta 23-197 Bench Grinder is a powerful tool. If you are doing a lot of fabrication work or repairing a lot of tools, then this might be the best bench grinder for you. The fact that it is 8-inches means it can hold bigger wheels which can do larger jobs faster. It also means the wheels are spaced farther apart, so it is easier to grind bigger pieces of material like smoothing the edges for counter tops.